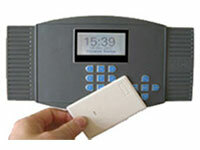 Our Proximity badge terminal uses a white HID card. This card can be kept in employee’s wallets or on a card rack. This non contact card system requires each employee to swipe their card across the front of this terminal. Simplex also have available a HID Fob key suitable to be attached to employees key rings.